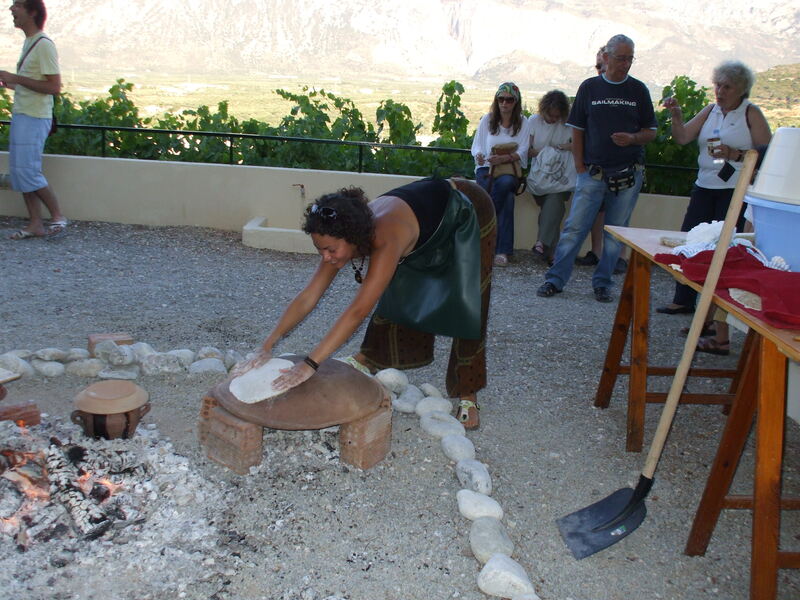 Update on Minoan Cooking at Instap Study Centre. 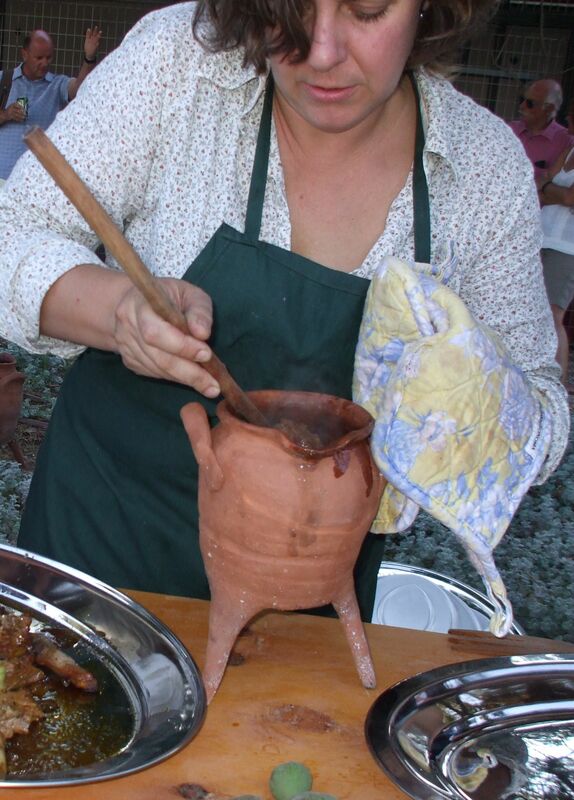 The second open day of Minoan cooking, once again was a huge success. Everyone was interested in not only being able to see the food being cooked but also to taste. Many of the tripod cooking pots which the Minoans would have used, my colleague at the study centre, Archaeologist Jerolyn Morrison had made replica’s for this experimental day. 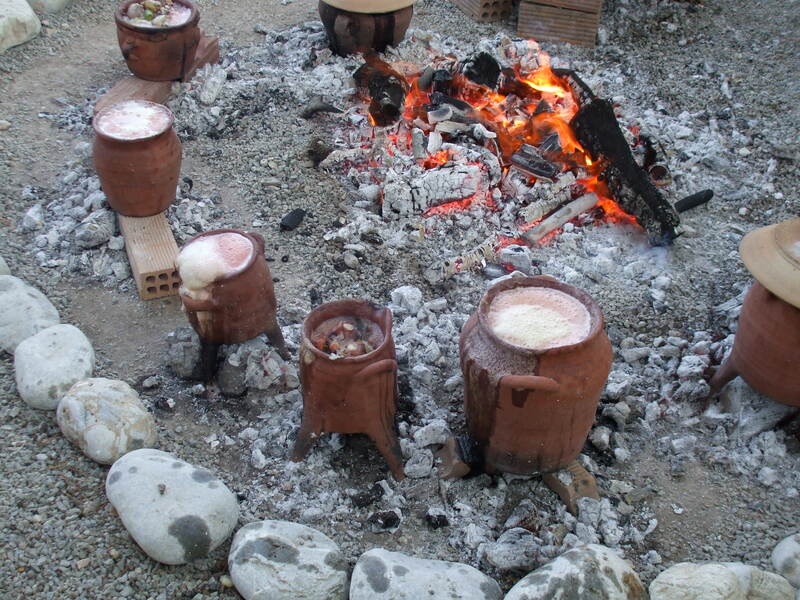 While the open fire was being prepared within a circle of stones, and the beehive style oven had been made ready to use for cooking the bread, the meat and octopus was also being prepared. The pork was first sliced into small pieces and had to marinade for l hour. Then boiled with leek, olive oil, pomegranite syrup,tyme and seasalt. The bread was made using wheat, barley,fennel seeds,fresh fennel and sea salt. Once the mixture was made into something looking more like pastry, it was then rolled out and placed on top of the oven where the charcoal was burning inside and kept to a suitable temperature. Jerolyn now informed everyone that the food was ready to taste and began by first serving the pork.To everyone’s delight including myself, the experience of such tender and tasty meat was delicious. And because I love fennel which was an ingredient in the bread I also liked, even though a little chewy and flat, because of course, no yeast would have been used in order for the bread to rise in Minoan times. Because I do not like octopus to eat I did not taste so will not comment, but those who do eat Octopus, commented that too was very tasty and cooked to perfection. I took a picture of one of the cooking pots shown below indicating the food residue remaining at the bottom. This helps archaeologists to discover what the diet might have been in Minoan times, or in fact any other period of time. 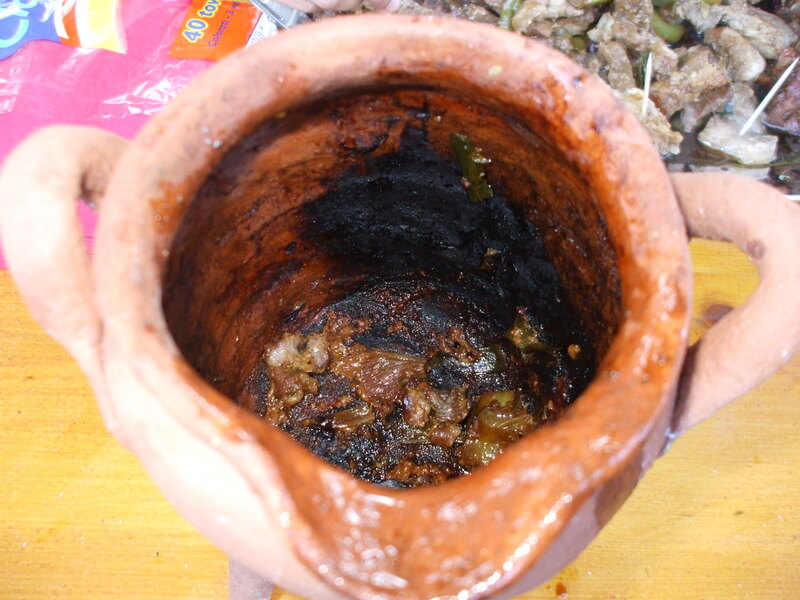 Residue of food inside pot. Harriet Boyd was the first woman to lead an archaeological excavation in Crete at a time when it was thought absurd for a woman to travel alone. She was small and dainty in height but with a fiery personality and loved by all in her profession of archaeology. Harriet discovered,excavated and published an account of the Minoan town of Gournia in Crete,and was the first woman to lecture to the Archaeological Institute of America-ten times in fourteen days in January 1902. She was known to have travelled many miles by mule over the extremely mountainous terrain of Crete to acheive her goals, she was a very determined young lady. Shortly after working with Richard Seager and Edith Hall who had joined her at the excavation of the Late Minoan town of Gournia Harriett retired from fieldwork following her marriage to Charles.H.Hawes proffessor of Anthropology at Dartmouth College . Apart from her archaeological acheivments ,lecturer and teacher,archaeology was only part of her life. In 1897 Harriet was nursing with the Red Cross in the Greco-Turkish war,in 1915 she was nursing Serbian typhoid victims on Corfu and by 1917 was in Northern France setting up a rehabilitation centre. Although Harriett Boyd Hawes as she was now known since her marriage to Charles Hawes, never returned to the field thus depriving American archaeology of one of the most gifted and dedicated excavators of her time,she did however continue to be active, involved in many other activities,most importent of all was her work on behalf of the publication of her excavations at Gournia. Due to her own efforts this publication appeared in 1908 entitled Gournia,Vasilki,and other Prehistoric sites on the Isthmus of Hierapetra, Crete and published in Philadelphia.